I am taking the month of October, all 31 days, to Bring this Home to Order. To clear my house of too much stuff..
To clear my mind of chaos! My goal is to update you daily here on the blog of my progress…frustrations and triumphs! I debated joining in with tons of other bloggers at the Nesting Place BUT decided to go for it. To use this as a way of keeping myself accountable. I would love for you to join me. Comment and share! 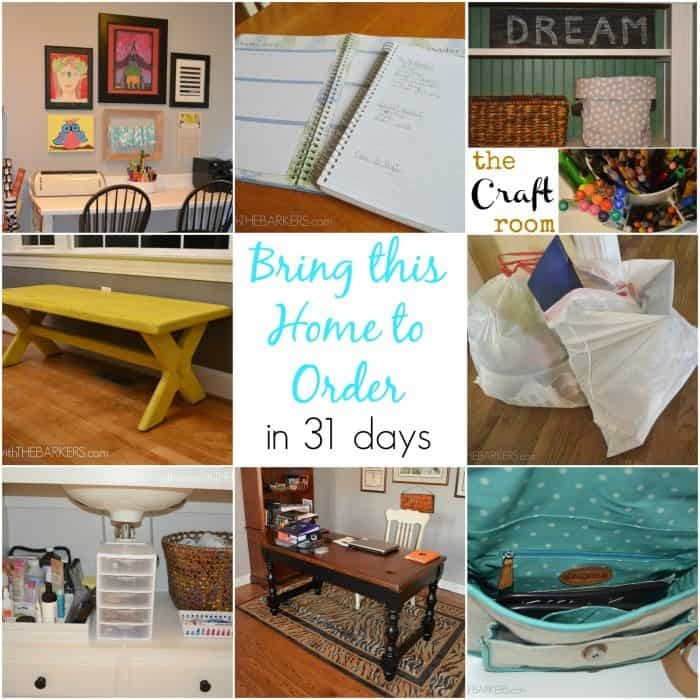 I will be using #bringthishometoorder on my social media…Instagram, Facebook and Twitter. Feel free to use the # as well to show me and others how you are joining in with Bring this Home to Order. With any luck you will get to see some completed projects along the way! ***all updated links from all 31 days are below! Oh my, if I made a list of everything in my house that needs order…it would be a mile long! Good luck with your challenge…I’ll be back to see what you’re up to! I’m excited to follow your 31 days. I have spent much of this year de-cluttering my home after my youngest graduated from college and moved on. This included updating her bedroom and bath, emptying every closet in order to re-carpet the bedrooms, going through office supplies, craft supplies, clothes and shoes, need I go on? Consequently we then spent a month getting ready for a massive yard sale, selling on Craigslist and then donating ALMOST everything last weekend after the yard sale. It feels so incredible to open closets now and see some blank spaces, nothing falls on my head, and I can find the shoes I want to wear without saying a bad word. It is so freeing to have the hidden areas of my house in order, finally, after raising 7 kids and never enough space. We are retiring next year and this was our first step towards downsizing. Go for it and you will be so happy and feel so free. My motto was SIMPLIFY SIMPLIFY SIMPLIFY. Now I will be able to devote some time to those unfinished or fun new projects that I’ve put off for so long. My first little reward was making a fall arrangement to hang by my front door after work yesterday and being able to find the supplies and whip it together in no time. Looking forward to your posts! I am just glad to see that others also have long lists of things that could, should and may be will one day be taken care of. I think Fall and Winter are good times to take care of what is not organized as it should be, before winter is over and Spring Cleaning and yard work starts. whatever there seems to always be something. Whew! I have accumulated too much and you have given me the inspiration to cleanse! 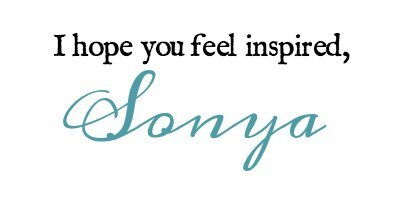 So inspired and excited for you Sonya! I’m feeling the positive peer pressure I talk to my girl’s about. I’ll be with you all the way. Sonya,this is so funny…I was telling the ladies I work with how I needed to clean out my house….Although we never meet I feel like i really know you well…..I’m ready to get my house back to order myself….I cant wait to get started…What FIRST!!!!! I think I will try this next time. 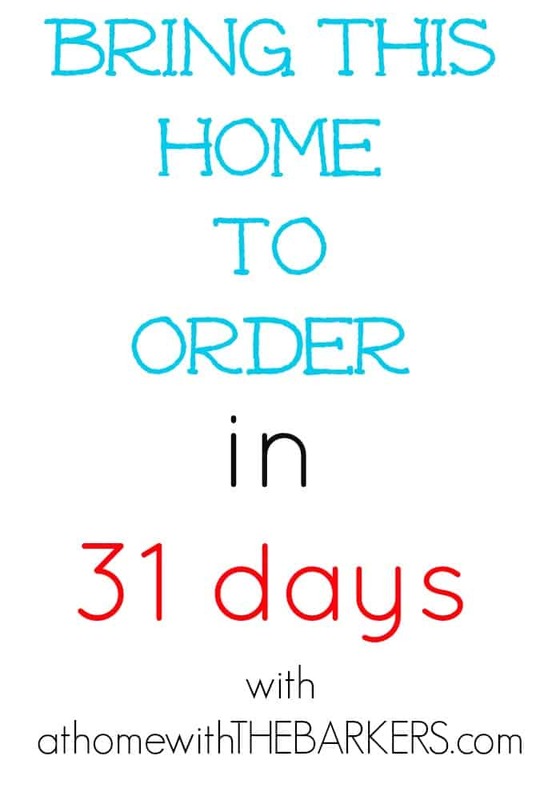 Can’t wait to see how well your home looks! It is a big task but I’m enjoying the challenge! You are a brave woman, Sonya Barker! I can’t wait to see all of the things you get done! There is nothing like public accountability! Sonya, I love this idea! I tried to start something like this awhile ago and maybe made it to…um….day 3? LOL. I think you’re about to inspire me to start up again! WOO HOO! Yes, we all have our personal projects in brings our home to order for sure, but been quite lazy with it, I got a mess at my room, don’t find the inclination to get things into order. Point is if I do it, anyway it will get messy again(: anyway…I guess it is about planning, make provisions to keep things here and there, must do smart renovation not just keeping room neat, it is renovation of sorts.